Over the past few weeks, I have been listening to a fascinating series of lectures by Dr. David Livermore of the Cultural Intelligence Center. I purchased the lectures on Audible as part of one of “The Great Courses” that they offer. 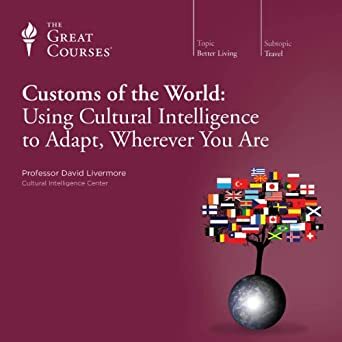 This course is 12 hours long and is entitled “Customs of the World: Using Cultural Intelligence to Adapt, Wherever You Are.” I would highly recommend the course in learning more about other cultures and as part of learning to work in other cultures and on multicultural teams. In one of the lectures, Dr. Livermore talked about how different cultures view time. Besides contrasting a value on punctuality with a value on relationships, he talked about monochronic and polychronic cultures. Monochronic means focusing on one task at a time. It assumes that one carefully plans one’s tasks, puts them into one’s schedule, and manages one’s time so that those tasks get done one after another. High value is placed on giving full attention to one task at a time and carrying it through to completion. I am reminded of a review I posted some time ago on a Wall Street Journal bestseller entitled “Deep Work: Rules for Focused Success in a Distracted World.” Western cultures put a high value on avoiding distraction, and so books about how to focus and overcome distraction are of great interest to us. We are regularly warned about the dangers of seeking to multi-task and are promised much greater productivity if we can focus deeply on one task at a time. In monochronic cultures, we also clearly differentiate between work time and personal time. We do not want to be bothered with work emails on vacation, and we are encouraged to fully disconnect from our work during “sabbaths”. Smartphones make this separation much more difficult and cause anxiety for those of us from monochronic cultures. But what if one did not sharply distinguish between work and personal time? What if one did not see it as a problem when friends and family call and ask for help during work hours? Latin American, Arab, African and Filipino cultures tend to be quite polychronic. In polychronic cultures, multiple responsibilities are carried out all at the same time. Multiple priorities are given attention simultaneously. People respond to needs and issues as they arise, regardless of where those requests for their attention might be coming from. They see it as unimportant or even impossible to focus exclusively on the task at hand so as to finish it as quickly as possible. People don’t stop fulfilling their roles of parent, spouse, friend and neighbour when they go to work. Those roles come with them and continue to put demands on their time while they are at work. In these polychronic cultures, relationships and human interactions are more highly valued than “getting things done”. Furthermore, those relationships and conversations do not neatly stay in designated and separate time slots but regularly run into one another. Multiple conversations can happen at the same time. I remember being very puzzled when I observed how Filipinos were constantly using their cellphones to text while in a restaurant with friends. Rather than concentrating exclusively on engaging in conversation with their friends across the table, each person was also occupied with constantly texting on their smartphone. I thought that what I was observing was a clear indication that the smartphone was eroding the highly relational aspect of Filipino culture. What I had failed to recognize was that the smartphone was actually just allowing another aspect of Filipino culture to flourish – their proclivity to polychronic time. Multi-tasking was a part of Filipino culture long before the invention of the smartphone! Those of us from monochronic cultures see those from polychronic cultures as being easily distracted. On the other hand, those from polychronic cultures may well see monochronic people as being inflexible and unable to take full advantage of new opportunities that present themselves. Interestingly, Livermore also noted that non-profit organizations tend to be more polychronic than for-profit organizations. Here we are talking about organizational culture, rather than national or ethnic culture. Leaders in non-profits often deal with issues as they arise, and give less attention to management by objective. Maybe this is because results are harder to measure in non-profit work and so priorities are determined by needs as they arise. I do not disagree with this last observation of Livermore’s. I have also observed that many of my fellow missionaries tend to be more polychronic in their view of time and work than me. In fact, my wife says she is much more polychronic than me! Should leaders of mission organizations seek to overcome distractions and learn to do “deep work”, focusing on one task at a time? Or can those who have a more polychronic approach to time still give effective leadership? It seems to me that good leadership comes in both varieties, but effective leaders need to understand and appreciate the strengths and weaknesses of both cultures – and assign roles and work tasks based on that knowledge. Major projects, including designing training courses or developing a policy manual will probably be best assigned to those with a more monochronic approach to life and ministry. On the other hand, I would suggest that maybe our best evangelists and disciple-makers are those who have a more polychronic view of life and ministry. Definitely, our best contact-makers are from this cultural orientation. Whatever they are doing, while working on a sermon, making a quick trip to the grocery store or spending time with their kids on the playground, they notice the needs of others around them and are ready to interrupt their schedule to talk to people they meet along the way. In what areas do you see polychronic cultures excelling in mission work? And in what areas do monochronic cultures do better? Thank you, Ken, for this interesting and helpful blog post. Looks like an interesting course from ‘Great Courses;’ I’ve ordered it as a result of your recommendation. In our “A Novel Approach” Series (ANA) we spend a bit of time on universal value dimensions (narrowing the down to ten). ANA is our methodology for cross-cultural workers to complete a full-fledged narrative-based ethnography, with the purpose of then using all the material to present a culturally-relevant Story of the Bible. I’ve attached 2 (of the 118) PPT slides we use in our ANA introduction.